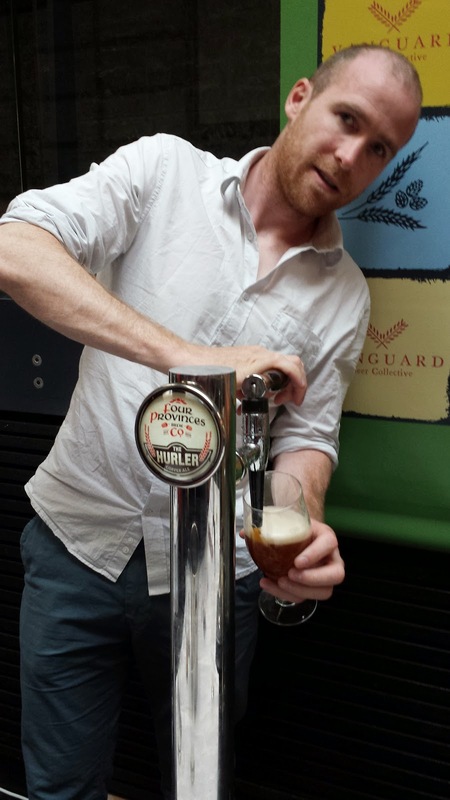 The European Beer Bloggers Conference was a resounding success for showcasing Irish beer this year. As always, there was a lot of different beers available and while the majority were Irish, not all were. Here's just a very small sample of the beer available. Most of the Irish beer I have had before so have already mentioned them at some point. I'm not really reviewing these beers I should point out, I made no notes during EBBC14 on any of the beer. I refuse to make notes at big beer events as it lessens my enjoyment and I also can't do the beers justice. So the following is just my mental recollection. 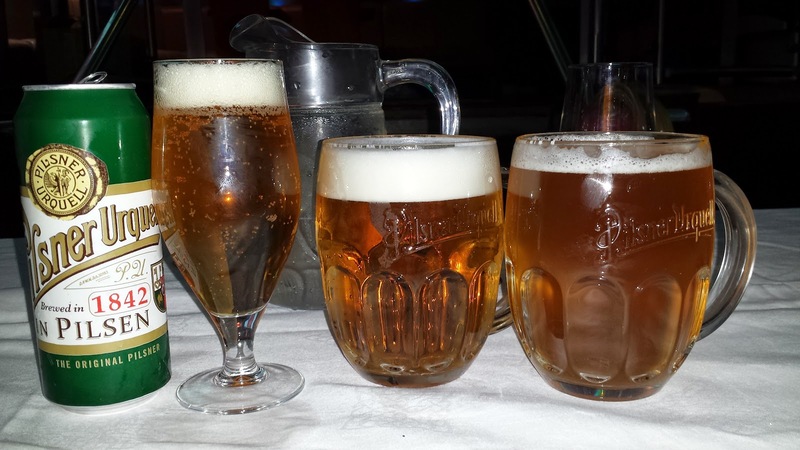 I'm going to start with a side by side comparison of three versions of Pilsner Urquell. On the left we have the new canned version, in the middle the regular kegged version and then on the fight is the unpasteurised, unfiltered wooden cask version. I found the new canned version to be quite lemony with a dry finish and quite lactic. A very different experience and I'm not sure I liked it. The kegged version on draught was crisp and clean with a great noble hop profile. The cask on the other hand was sweeter with a bigger hop nose in the foam. Not as crisp due to the lower carbonation. Personally, the cask version is my favourite but I was very keen on the kegged version. I have always been a Pilsner Urquell fan, except in bottles and I guess I am now not a fan of the cans either. That said, the cans were far superior to the bottle. I believe they are going to switch to brown bottles soon so that might be better. 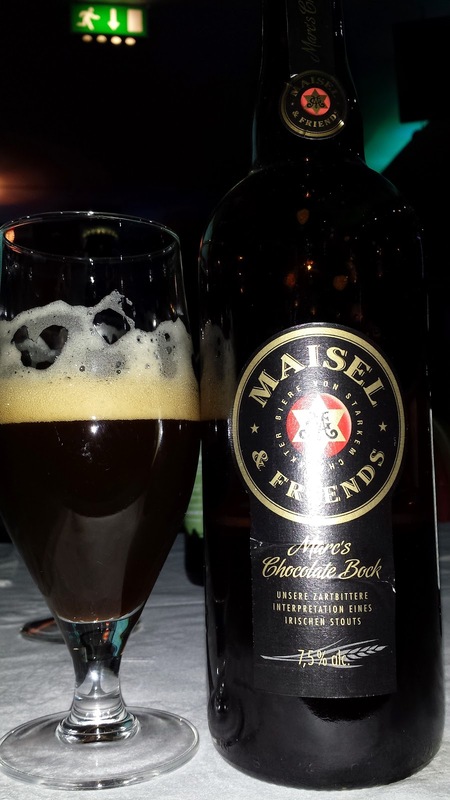 Maisel's Chocolate Bock is a beautifully rich chocolate flavoured bock. It was woody and had a real chewy toffee body. There was even a hint of spice mixed in with the massive cocoa hit. A lovely beer and I personally found it easier going than most bocks. 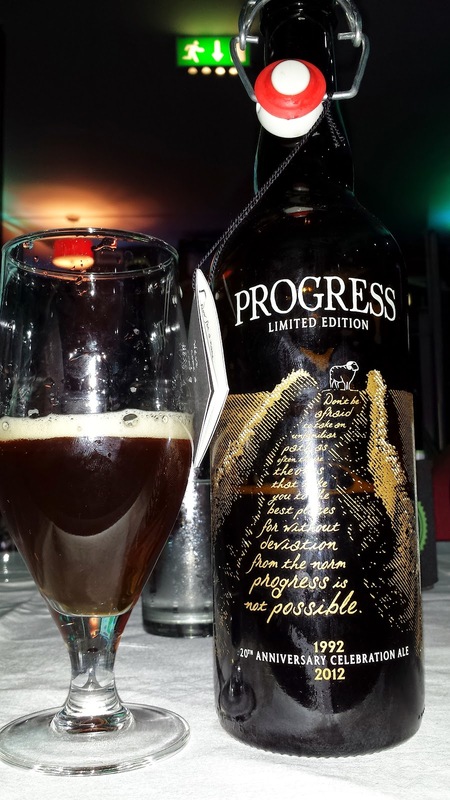 The limited edition Progress from Black Sheep was a stunning 10% old English ale. It's basically a barley wine in my opinion. Thick molasses, figs and various other dark fruits. There was also a lot of vanilla and a nice grassy bitterness. Awesome beer! 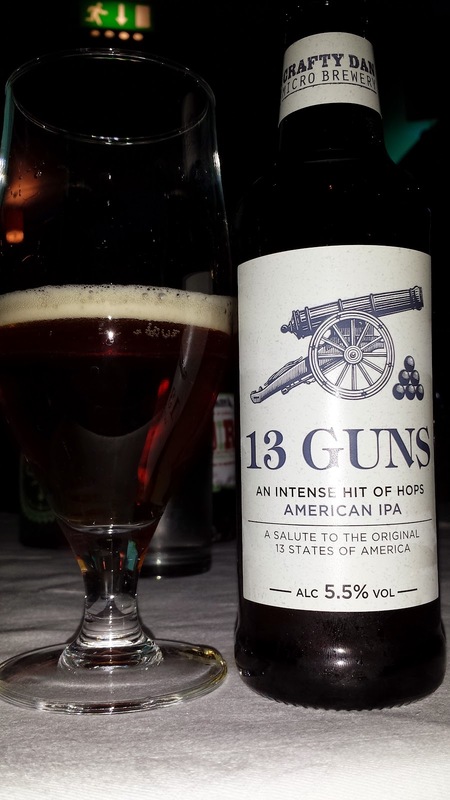 13 Guns is salute to the American IPA from Thwaites and while it is an excellent IPA, it seems more subdued than the brash American versions. It just seems more reserved, more English. That's not to say anything about the hops because they are all American. The result is very tasty but never overbearing. It has everything you want in an IPA without being loud-mouthed about it. 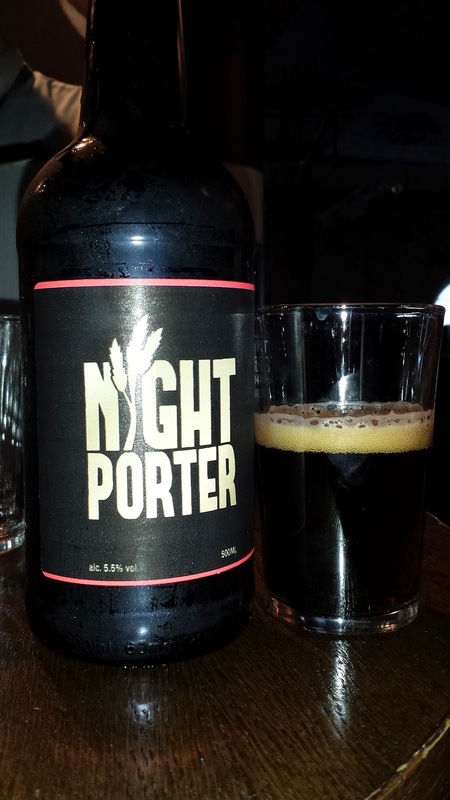 Night Porter, I mentioned it already. This is the internal Guinness competition winning beer that is only available in the Guinness storehouse. If there is one reason to go to the Guinness storehouse, this might just be reason enough. It's an outstanding beer that can stand beside any craft beer and be confident that it's in the right company. In a way, it is craft beer. It was brewed on their 100 litre pilot system. It's the kind of beer that would earn Guinness some of the respect it lost with beer aficionados after stunts like covering rival taps on Arthur's day and just Arthur's day full stop. 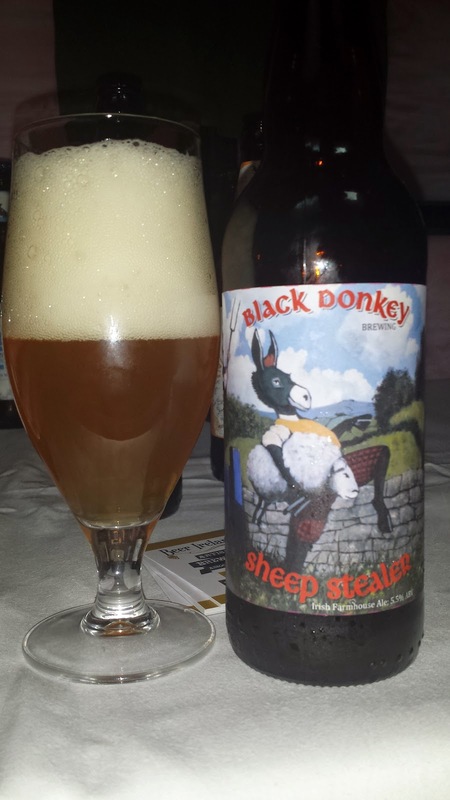 Now to me on the Irish scene was the first beer from Black Donkey. In fact, this might have been its first public appearance. The beer is called Sheep Stealer. I know one or two bloggers might not have questioned the branding but I like it. It's an incredibly tart saison that just resonated with me as one of the best summer thirst quenchers I've had in a while. I'm not sure when it goes on sale yet but hopefully it will be pouring at the ICBCF in September. One of the unexpected highlights at EBBC14 was finding Stuart Howe personally manage the Sharp's stand. Stuart knows what bloggers want (he's one himself) so he prominently placed the specials in front of the regulars like Doom Bar and encouraged us to try them. I doubt anyone in the room hadn't had Doom Bar before so I think that ended up being pushed aside to make room. 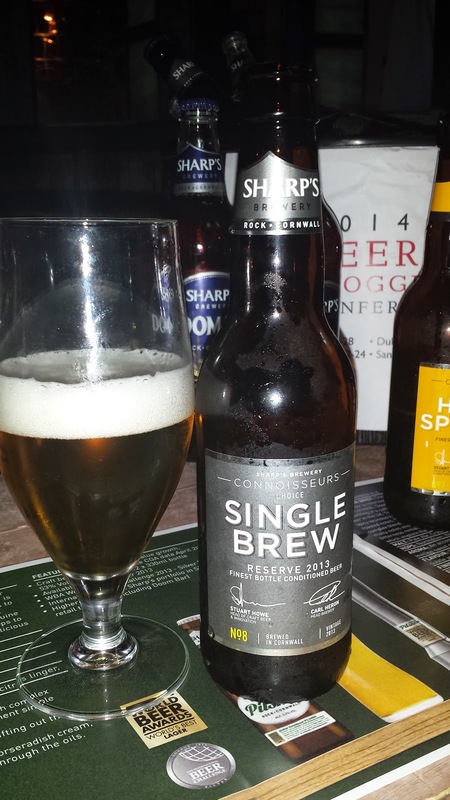 Single Brew reserve 2013, pictured above is phenomenal in its simplicity. There's a single hop at play here called Premiant. Think Saaz on steroids and you have an idea what to expect. The beer is dry hopped for two months using said hops and the result is a very complex but also sessionable (4.5%) blonde ale. Lots of grass, citrus (lemon and grapefruit), tropical fruits and a fair bit of caramel too. 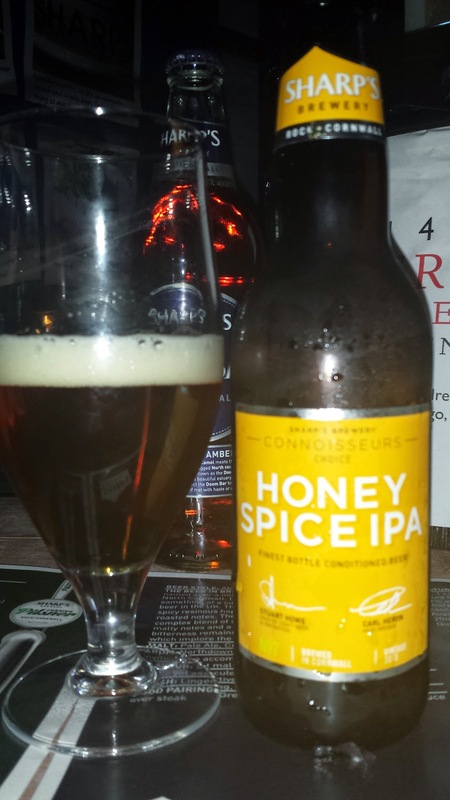 I was intrigued by the Honey Spice IPA as I was curious to see if it's the kind of beer my wife would enjoy. Ever the fan of Fullers Honey Dew, I suspected she might be. This is a 6.5% American style IPA that employs local Cornish honey and black peppercorns to add a little honey and spice to the overall beer. Notes of lychee, grapefruit and lemon with a big malt body. Hints of honey, not overpowering and then the pepper cuts through the heavy malt. The result, a beautiful and interesting beer and one I intend to try again if it appears over here. 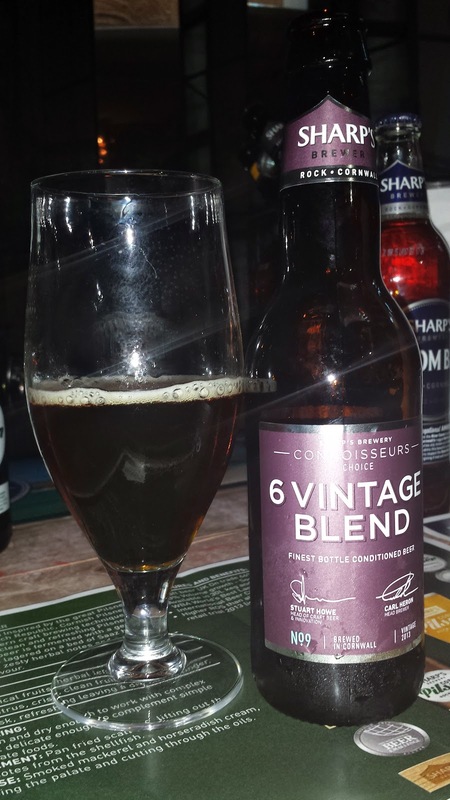 Of the three Sharp's, the 6 vintage blend was the biggest and most complex. They basically take 5 aged beers and blend with a standard base beer to create this wonderful beer. When I say blend, I don't mean they take the same style aged for various lengths of time. Everything from IPA to Belgian dubbel is included. It's a stunningly complex beer and I'm just sad I didn't nab a bottle for consumption in my own time. And lastly, a fairly new beer to the Irish market. Four provinces is a new Dublin based brewery which is great because Dublin has been left behind in the brewery stakes due to the higher cost of premises in Dublin. The Hurler is an American hopped copper ale. I like what they are doing here, they avoided the Irish red pitfall and made a compromise. A "copper" coloured ale packed full of hops. The result is an extremely bitter beer but with an ever present malt backbone to balance it out. It's a fantastic beer and I look forward to having it again. I definitely picked up a lactic 'tang' in the canned PU that's not in the draught version, not unpleasant but definitely takes away from the noble hop character. If it was a craft brewery, I would put it down to a bad batch. But PU? There shouldn't be bad batches so I wonder if it's just the way it is? I'll likely grab a can when they make an appearance over here.